The season’s opener is only a week away, and Portland senior pitcher Kyle Kraus and sophomore outfielder/designated hitter Turner Gill were both selected to the 2012 Preseason All-West Coast Conference Team. San Diego is tabbed as the favorite to win the conference title this year, while the Pilots are picked to finish eighth. 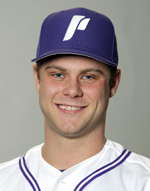 The Pilots Baseball Team opened the 2012 season today with a win down in Beaumont, Texas. Kyle Kraus pitched 7.0 solid innings and Kris Kauppila drove in three runs as the Portland Pilots opened the 2012 season with an 11-0 shutout of Stephen F. Austin at the Lamar Classic on Friday afternoon. Kraus, a senior right-hander struck out seven and allowed just three hits. The Pilots (1-0) scored during each of the first four innings, including a five-run third inning to hand Kraus (1-0) all the support he would need. Ben Grubb opened the scoring in the first inning by knocking in Kauppila, who had led off with a double. Portland added two more runs in the bottom of the second inning, courtesy a two-out, two-run single by Kauppila, before the five-run outburst in the third. Jeff Melby had the big hit during the frame, a two-run double, while Kauppila and Caleb Whalen also picked up RBI’s. Grubb drilled a solo home run in the fourth, and Sam Westendorf drove in a run in the seventh to cap the scoring for the Pilots. The win gives Kraus, a pre-season All-American, 21 for his career, leaving him just four W’s shy of matching the all-time mark for career wins at UP. Kraus walked just two and allowed just one runner to advance past first base. Junior right-hander J.R. Bunda followed Kraus on the mound and retired the Lumberjacks in order during the final 2.0 innings. Bunda struck out a pair. Chase Greening (0-1) took the loss for SFA (0-1), allowing eight runs, five earned, in 3.0 innings of work. Greening was one of five pitchers used by the Lumberjacks. Kauppila and Grubb each finished with three hits, while Melby had two. Kauppila also scored three times. Chris Hernandez had two of SFA’s three hits. The Pilots next face tournament host Lamar at Vincent-Beck Stadium on Saturday. First pitch is set for 10 a.m. (Pacific), and the Pilots are scheduled to start freshman left-hander Travis Radke on the hill. Great start for the Pilots as they won both games they played in Texas to open the season. The Pilots followed Friday's 11-0 victory with a 10-5 win on Sunday. Saturday's game was - of all things - rained out! They could have stayed home and have that happen! Anyway, the coach has got to be pleased with how things unfolded. 20+ runs and 20+ hits over the two games plus some superb pitching. I know it's early but you gotta like the way things have started. Team batting avg. is .311 with a 1.000 team fielding percent. No errors and great defense to go along with the offensive onslaught that included 3-4 dingers that left the yard. The team's home opener for tomorrow has been shifted to Concordia's new stadium and its artifical turf. This weekend the Creighton University Bluejays come to town sporting a 3-0 record for a 3-games series with the Pilots. Let's hope the weather holds for the games and the Pilots mojo continues. 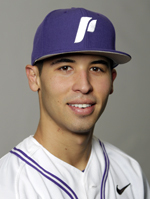 Portland senior shortstop Kris Kauppila was named the West Coast Conference Player of the Week after helping the Pilots open the season with two convincing wins over Stephen F. Austin. Kauppila went 5-for-9 (.556) at the plate during the weekend with four RBI’s, a double, a homer and six runs scored. He also swiped one base and was flawless in the field. During UP’s season-opening 11-0 win over the Lumberjacks in Beaumont, Texas, on Friday, Kauppila had three hits, three RBI’s, three runs, a double and a stolen base. He led off Sunday’s 10-5 win with a solo home run. He’d add another hit and a walk, while scoring three times. Interestingly, just ran across this article on espn.com. Doesn't mention Portland specifically, but says the WCC "raised an eyebrow" with all teams winning their series' except USD. Just got back home and semi-dry. The rainstorm in the middle of the game ruined my scorecard but it was good to see some baseball again. The guys got lots of extra base hits today. Radke, a freshman, got the start and went two good innings, then lots of guys got one inning each, as often happens in midweek college games. Concordia has a nice new stadium. The baseball seats are much closer to the field than Etzel. Some light poles and fence posts obstruct small parts of the view in some seats, but then again 2/3 of the seats at Etzel can't see the left field line. The Creighton Blue Jays are receiving votes in both the NCBWA and USA Today/ESPN National Polls and lead the all-time series with Portland 3-1; Creighton won all three games against the Pilots in Omaha, Neb., last season, and UP’s only win against the Jays came in 2000 in Phoenix. It only rained the last 20 minutes of the game. They got the whole thing in--all 10 innings in 2:21. Turner Gill hit one out in the bottom of the 9th with two outs, then Kauppila singled home the winning run in the 10th. Pilots walk off 3-2. You don't see many home runs in college ball anymore. The new bat rules mean they're almost like wood. • All military personnel and family will received free admission to the ballpark all weekend long. • Before Friday’s series opener at 2 p.m., a pair of F-15’s will fly by Joe Etzel Field (weather permitting). The jets will travel about 300 miles per hour at about 1,000 feet. Portland senior right-hander Kyle Kraus tossed 8.0 solid innings, Owen Jones picked up the save and Cody Lenahan provided the game’s only RBI as the Pilots blanked the visiting Air Force Falcons 1-0 at Joe Etzel Field on Friday afternoon. Kraus, who now has 22 career victories, is just three wins shy of matching the all-time program mark for career wins at UP. Friday was the first game of a scheduled four-game series between the Pilots and Falcons, who are set to play a double-header on Saturday beginning at 11 a.m. The series concludes with the finale at 1 p.m. on Sunday. 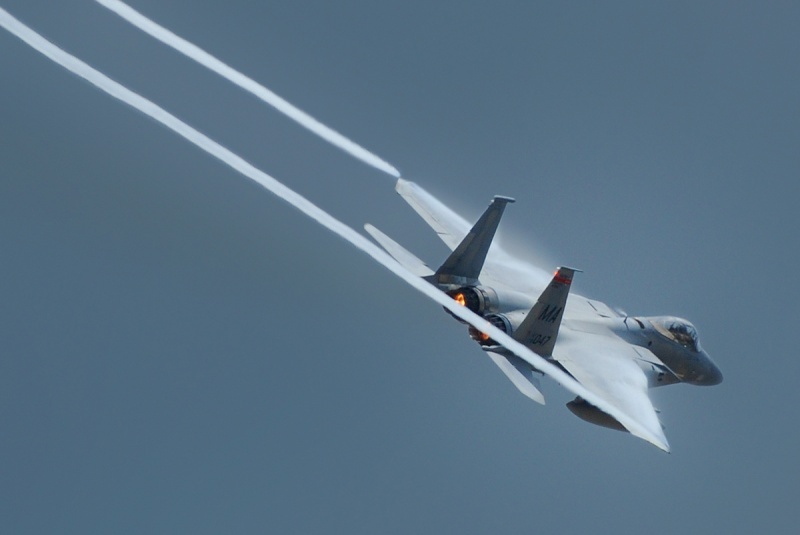 UP is celebrating Military Appreciation Weekend at Joe Etzel Field, and Friday’s game was preceded by a fly over from two F-15 Eagle Jets from the 142nd Fighter Wing. Lots of rain showers to play through, but the Pilots win the first game of a doubleheader against Air Force, 6-2; Radke gets the W.
Second game delayed by rain, but we're underway! Dang, rained out against USAFA. Heading home to watch the NCAA selections, while the Pilots head to Seattle for a spring-break game? Seems the wrong direction to travel for spring-break. Portland senior reliever Owen Jones was named the Rawlings West Coast Conference Pitcher of the Week after saving all three games during a weekend sweep of Air Force. Jones now has five saves on the year, helping Portland to a 10-2 start to the season. Jones, a right-hander from Edmonds, Wash., pitched in all four games last week as the Pilots went 4-0 at home against Concordia and Air Force. In 3.2 innings overall, Jones fanned seven of the 11 batters he faced, while not allowing a hitter to reach base. On Saturday, he saved both games of the double header against Air Force, striking out three in 1.1 innings during the first game. He struck out all three batters he faced during the 5-0 win over Concordia on Tuesday. Portland is off to a 10-2 start for only the third time in program history, and the Pilots have matched the program’s all-time mark with 10 straight home wins, dating back to last season. Thanks for that. It was a lot more comfortable watching it from my leather chair than it was on the cold aluminum at JEF. Huge props to the UP SID office for taking the time to do the highlights and the voiceover! Just look around at other schools' websites... UP is incredibly spoiled with the amoung of content our SID office produces beyond all the weekly notes, press releases, game recaps, and stats that they do - video interviews, player blogs, highlights, photos, social media, etc etc. Pretty incredible, really. a good model to look at would be pepperdine. usually video recap every game with interviews by players and coaches. Gotta love the snow delay. SEATTLE - Portland scored three runs in the second inning and then held on to beat the Washington baseball team, 4-1, Tuesday evening in a non-conference game at Husky Ballpark. The Pilots improved to 11-2 on the season with the win while Washington fell to 10-6. 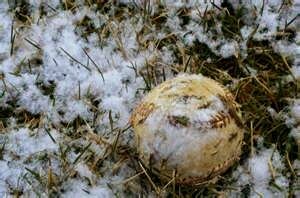 The game featured a half-hour delay in the middle of the seventh inning due to snow. Portland reliever Matt McCallister (3-0), who entered the game to begin the fourth inning, picked up the victory. In five innings, he allowed one run on four hits. Owen Jones pitched the ninth to pick up his sixth save. Husky starter Mac Acker (2-2) took the loss, allowing three runs (one earned) on two hits and two walks over one and one-third innings. UW relievers Steven Swift (three and two-thirds innings), Adam Cimber (two) and Zach Wright (two) held the Pilots to just one run the rest of the way after the second inning. In the second, the Pilots loaded the bases on an error and a pair of walks before Nick Armenta drove in two runs with a one-out single through the left side. With Steven Swift on in relief for the UW, a hit batter reloaded the bases and a sacrifice fly from Pilots second baseman Cody Lenahan made it a 3-0 Portland lead. Washington scored its first run in the fifth when Michael Camporeale led off with a double to deep center and then eventually scored from third on an Erik Forgione groundout. The Pilots added a fourth run in the ninth when Armenta scored from third on a passed ball. In the bottom of the ninth, the Huskies brought the potential tying run to the plate after a walk to Jacob Lamb and a single from Camporeale, but Jones got a strikeout to end the game. The Huskies got two hits each from Camporeale, Jayce Ray, Joe Meggs and Branden Berry. Armenta and Brian Fratalli contributed two hits apiece for the Pilots. This weekend, the Huskies begin Pac-12 Conference play with a three-game series vs. Oregon at Husky Ballpark. Game times are 5:00 p.m. Friday, 2:00 p.m. Saturday and 1:00 p.m. Sunday. PurpleGeezer wrote: Up is now 11-2. From the Huskie site :Gotta love the snow delay. It's spring break for gosh sakes, why are they playing in the Northwest!! Pilots win the first game Fri, 8 to 1, scoring 7 runs in the 5th Kraus getting the win. NR's starter was 0 - 3, now 0 - 4. First time Ive been to Concordia's soccer baseball complex and its pretty weell done. Infield all grass except for around the bases. By "all grass", you of course meant "no grass". Alas, Pilots drop game two of the double-header 3-1. Rubber match set for Sunday, 1 PM. Northridge threw their best pitcher in the second game and Radke hadtohave pitched pretty darn well . Sorry I had to leve after the fist game. 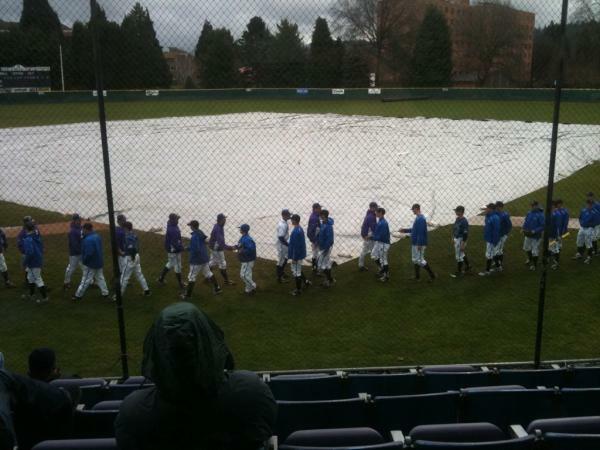 After an earlier 30 minute snow/rain delay, and with the score tied and two outs in the bottom of the ninth inning, Portland’s Michael Lucarelli hit a walk-off single to center field that scored Chet Thompson from second base and gave the Pilots a 2-1 win over the Cal State Northridge Matadors on a cold and wet Sunday afternoon at Hilken Stadium. Portland wins the three-game series and improves to 13-3 on the year, the second best start to a season in program history.